More than 65% of consumers conduct online product research before stepping foot in a store, amplifying the need for retailers to optimize digital experiences. Editor's note: The following is the fifth installment in Retail Dive's Consumer Survey, a six-part series examining the psyche of the American consumer and the evolving role of the brick-and-mortar store in the shopping journey. Check out all of our results on our landing page. The pre-purchase shopping routine today takes many twists and turns as consumers move from clicks to bricks with relative ease to browse and buy. While convenient for shoppers, it's becoming harder for retailers to know exactly where and when the shopper journey actually begins. Consumers today have more tools than ever before to conduct pre-shopping product research online before heading into a store — and retailers that leverage best-in-class digital content, including photos and videos, consumer-generated product reviews, findability based on keywords, and search engine optimization, are more likely to win over the final sale. In our fourth installment of the Retail Dive Consumer Survey, we explored the connection between digital and physical browsing and buying habits, focusing on how often shoppers visit brick-and-mortar stores to see, touch and feel products before ordering them online. Now in our latest and fifth installment, we examine the opposite approach, asking 1,288 consumers how often they research products online before shopping for those items in physical stores. According to our results, the answer is fairly often. Two-thirds of surveyed consumers said they research products online — at least occasionally — before shopping for them in a store. And nearly half take the research online / buy offline path frequently, if not always. Generally speaking, it’s younger shoppers (25-34 years) and especially younger men who are more likely to behave this way. As these shoppers scour the web for product research, they tend to focus on two channels: online reviews (say 55% of global consumers) and company websites (say 47% of global consumers), according to KPMG’s 2017 study "The Truth About Online Consumers." Shoppers find these to be the most trustworthy channels for learning more information about products. According to Nielsen’s Global Trust in Advertising Survey, branded websites and consumer opinions posted online rank as the second- and third-most trusted sources of information, respectively, just behind recommendations from family and friends. Growth in e-commerce capabilities, digital marketing and smartphone ownership has given way to a constantly connected consumer who bounces among stores, desktops and mobile devices. Oftentimes, the shopper journey means researching online and buying offline or vice-versa, and increasingly, it even means researching on the go via a smartphone while in the store. The ability to research products online prior to visiting a store — or increasingly, research products and prices via a mobile device while in-aisle — has become an integral part of the purchase journey. Our latest survey findings show that 67% of consumers say they research products online — at least occasionally — before shopping for them in brick-and-mortar stores. What’s more, one in five shoppers (19%) say doing pre-shopping research on the web is a must. Just a third (33%) of consumers report they never do online research first before heading to a store. These findings highlight the need for brands and retailers to have top-notch digital capabilities and content in place to ensure they’re providing all the relevant information consumers seek, such as detailed product descriptions, specifications, photos and use-states. PowerReviews research shows that consumer-generated content like ratings and reviews greatly influences purchase decisions as well — particularly among younger shoppers. Showcasing best-in-class digital content should be a priority for every company in the modern era of retailing. Contrary to popular belief, the youngest shoppers in our survey (18-24 years) aren’t the ones conducting all the product research online. In fact, when compared with the overall shopper base, significantly fewer 18-24 year olds (54%) said they research products online before going to the store. Some likely explanations for this behavior are the level of social and impulse shopping done by this younger set, coupled with the fact that their intended purchases likely are relatively low-ticket (and therefore, low risk) items that may not require tons of research beforehand. Also, some studies have found Generation Z to be more inclined to seek out social and human interaction. This could be playing out in their shopping behavior, with Gen Z gravitating toward experiential shopping and in-store product interaction. There’s also a strong possibility that they’re clicking “buy” while researching online without ever stepping foot in a physical store. 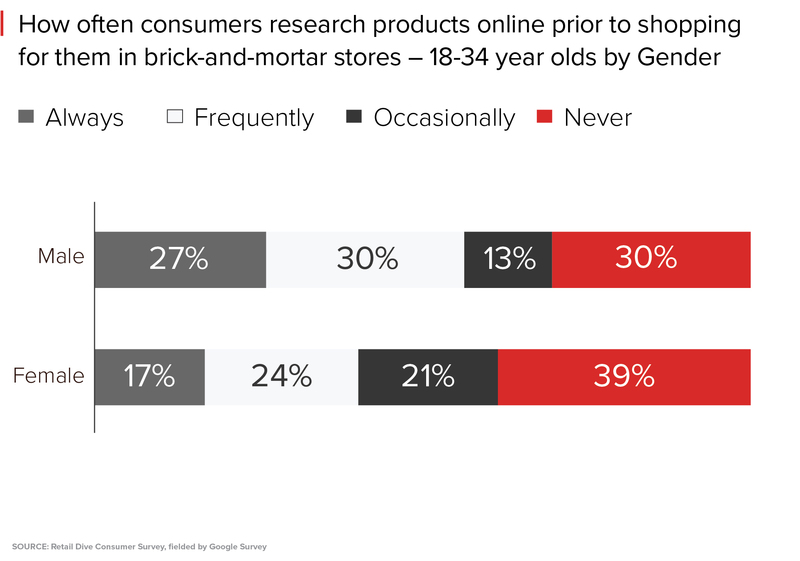 Our survey results found that the slightly older 24-34 year-old segment are actually the most likely to research products online before shopping in stores. In fact, 73% of them say that they at least occasionally and 57% say they always or frequently conduct online pre-shopping research. Likely busy with building a career and/or taking care of a young family, these shoppers can’t afford to waste time or hard-earned dollars heading to the store before knowing all the facts, pouring over details and reading reviews about products they intend to buy. 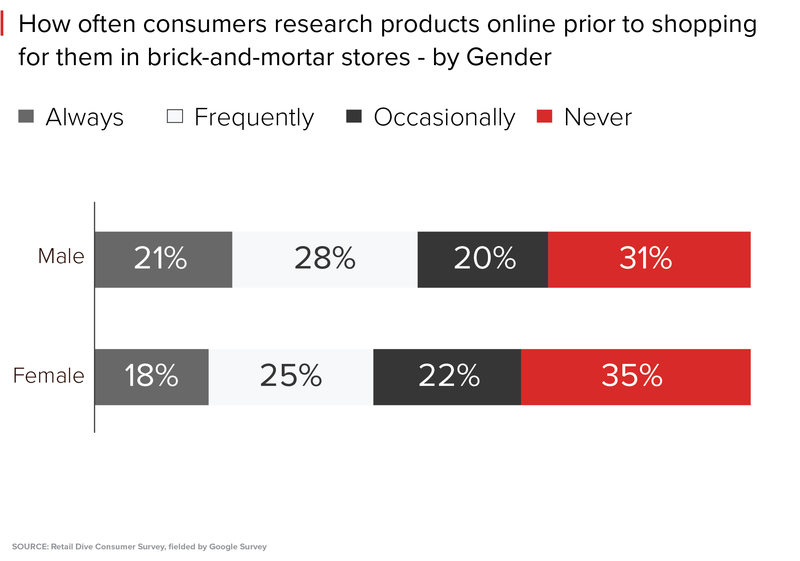 When examining the overall shopper base, no obvious differences in behavior exist by gender when it comes to pre-shopping online research – just a slightly higher percentage of females say they never research products online before going to a store. Digging a bit deeper, though, there are some striking differences between younger men and women: 57% of males in the 18-34 age range, versus a significantly lower 41% of 18-34 year-old females, always or frequently research products online prior to shopping for them in a store. 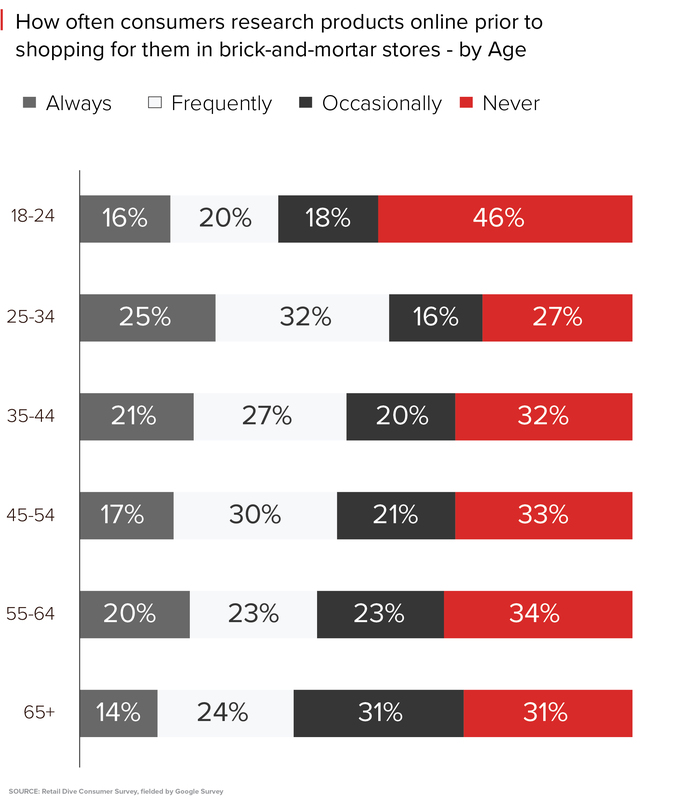 Conversely, 39% of 18-34 year-old females, compared with a significantly lower 30% of 18-34 year-old males, say they never do online research on products before shopping for them in a store. These shopping behavior differences between genders likely reflect the types of products most typically bought by younger men (think electronics and maybe DIY) – versus younger women (think fashion apparel, home goods and more than likely groceries). While it's becoming increasingly difficult to discern where the shopping journey actually begins, what is obvious is that a large percentage of shoppers conduct pre-shopping research online before they visit brick-and-mortar stores. Therefore, the urgency in which retailers must work to create a seamless omni-channel shopping experience is real. Making sure shoppers are able to find products and product information online should be a key priority for brands and retailers. This means building best-in-class digital and SEO capabilities as well as detailed product descriptions, helpful photos – perhaps even 3D photos with 360° and zoom imaging or augmented and virtual reality – and authentic consumer-generated content like ratings and reviews, in which shoppers clearly place a lot of trust. Stay tuned for the final installation of the Retail Dive Consumer Survey series, in which we examine how consumers use their mobile phones when shopping in stores. We'll be back.